UNITED NATIONS, Sept. 27 (Xinhua) -- Chinese State Councilor and Foreign Minister Wang Yi said Thursday that China respects Syria's sovereignty and independence, and is willing to support its social and economic development. Wang made the remarks when meeting with Syrian Deputy Prime Minister and Foreign Minister Walid Muallem at the United Nations headquarters. China attaches great importance to Sino-Syrian relations, will not be absent from Syria's reconstruction and is ready to play a positive role in the economic and social development in the country, said Wang. Also, China appreciates Syria's active engagement in the Belt and Road Initiative and would like to take this opportunity to promote further economic exchanges, he said. 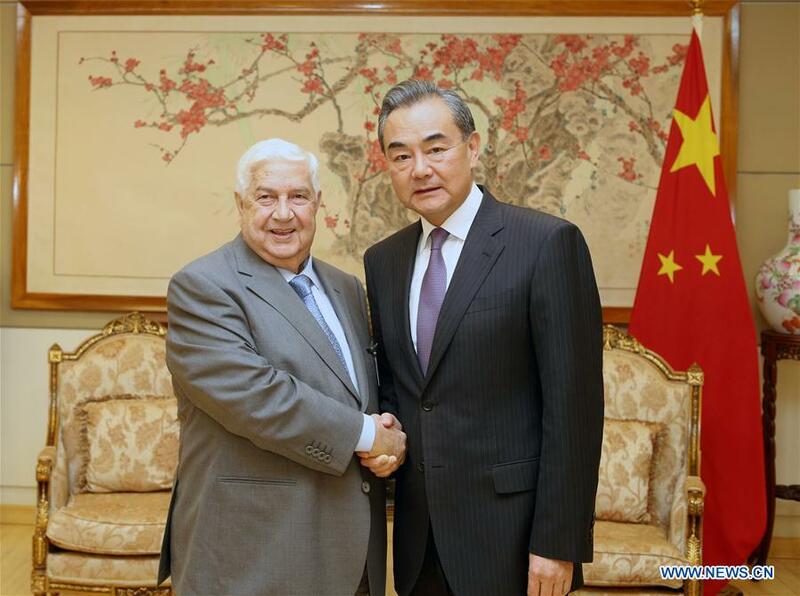 Echoing Wang, Muallem said that Syria treasures its friendship with China which is a major country with global influence, adding that his country commends China's constructive role in pushing for peace and stability in Syria and in mitigating the humanitarian situation.